Most analysts name four innovations that have disrupted how businesses deliver IT services to their customers and employees. These are the mainframe computer, the mini-computer, the personal computer and the Internet. The fifth wave of disruptive innovation is currently underway. This is the convergence of social, mobile, analytics and cloud technologies commonly called SMAC. Each of these technologies is valuable alone, but to unleash the full potential of SMAC, all technologies must be integrated and leveraged properly. The concept of SMAC is relatively new; it first appeared in 2010. SMAC allows businesses to create their own environments to engage more customers and improve productivity while minimizing overhead. Social media gives businesses access to more customers and new ways to interact with them. Social sites such as Facebook, LinkedIn and Twitter continue to increase their memberships dramatically. The data mined from these sites can give businesses greater insights into what customers want. Mobile devices have had a significant impact on how people shop, work and communicate. Smartphones are the most commonly used mobile devices, but the category also includes laptop computers, tablets and phablets. Customers can research products, communicate with businesses or make purchases from any location. Employees can stay connected even when they cannot be in the office. Analytics provides business the opportunity to gain meaningful insights about how customers behave. Trends can be identified that shed light on where, when and how customers make purchases in specific categories. After analyzing the data, businesses can predict how customers will respond to certain promotions, content or communications. Marketing efforts can be targeted at the granular level to provide personalized, meaningful experiences that will engage customers. Cloud computing enhances the delivery of applications and information to users. Users can access the cloud from anywhere that has an Internet connection, so they are no longer tied to a desktop computer in an office. Work can be handled from virtually any location, increasing productivity. Collaborative efforts can be enhanced through shared data and documents. SMAC has the potential to change the way that companies conduct their normal business operations. Customers, employees and vendors have increasingly come to expect the convenience of flexible applications that allow them to complete transactions from anywhere, at any time and using any device. Businesses will be forced to comply if they are to remain competitive. Just as the Internet compelled businesses to invest in websites, SMAC will force them to embrace the new technologies or risk falling behind. Two statistics support this prediction, according to industry analysts. As of 2010, there were approximately one billion devices connected to the Internet. By 2020, the number of connected devices is expected to reach 100 billion. Corporate IT departments will have to adjust to the new demands placed on them. Programmers and even CIOs will find that their roles will require a vast array of skill sets to support emerging technologies. The need for agility will increase to allow businesses to respond to opportunities in the market or react to the competition. 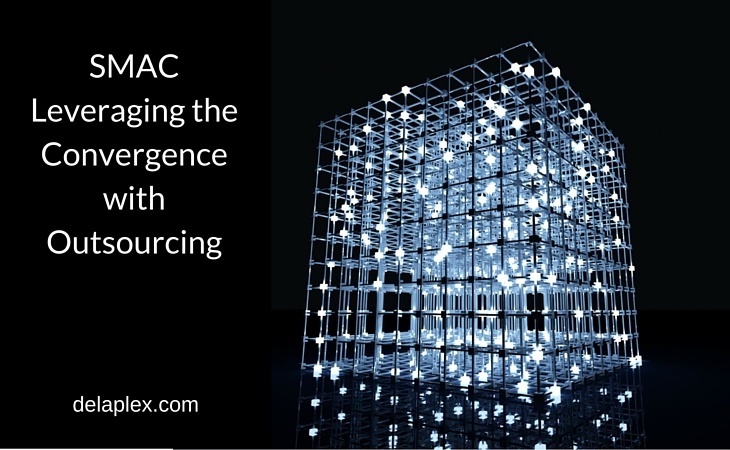 Like other businesses, SMAC is having an impact on the outsourcing industry. Since the concept of SMAC was first introduced, outsourcers have been aligning the new technologies with development processes. As a result, they can now offer greater responsiveness and improved quality at faster speeds. Clients can retain the agility to react quickly to any changes in market conditions, industry regulations or business intelligence. One area to which outsourcers have paid special attention is the security of the solutions that they offer. Privacy laws and industry regulations are constantly changing. Issues began with the introduction of the Internet. Social media, mobile devices and cloud computing have brought an increased need to protect data from unauthorized access, secure devices against hackers and ensure that all applications, connections and data storage comply with specific regulations required by law or industry standards. Outsourcers have been forced to become experts in all the different security and regulatory issues, and as a result, they incorporate the latest protections in every product they develop. In many cases, outsourcers are aware of vulnerabilities or viruses long before the average manager of a corporate IT department. As SMAC becomes increasingly prevalent, more companies will require outsourcers to keep their data and applications secure as well as develop new applications to respond to a global economy that is becoming more complex by the day. At delaPlex Software, we are committed to helping our clients leverage technologies in innovative ways. Our employees have the skills and experience to plan, design, code, test and support your applications. Our clients benefit from a dedicated team that takes the time to learn about their business in great detail, and clients can communicate with their team members directly via video calls, telephone, Skype or email. With our agile method of development, you get faster deployment, allowing you to begin realizing a return on your investment in less time. Whether you need to supplement your existing staff or engage a true technology partner to handle all of your software development needs, we are ready to help.